← Storing Chocolate and Its Shelve Life. Your Water has Failed What to Do Next? The grid has just failed for one of many reasons, running from earthquakes to economic collapse. You are without power and don’t know when it will come back on, but it appears that it will be at least several days. So one of the first things you need to think about is protecting and using the water you have on hand. If you have any warning, fill your bathtub and other containers. Then shut your water off at the street if you are on a municipal water system. This will protect the water in your piping and water heater from becoming contaminated from outside sources. This water can then be collected, by opening your lowest water tap. This will probably be outside and you can have several gallons of water in your piping. Extra water can be found in the water heater and in the toilet tank. The one on the back, I would not recommend the toilet tank water for drinking without treating. If you have been using one of those blue additives don’t drink it period. If you are on a well, you should have water in the pressure tank, depending on your system this can be from 30 gallons up to several hundred. Learn where this tank is located and how to access the water in it. Next, get an idea of how much water you have on hand and think about rationing it. If you have access to other water sources that require treatment, hopefully you have a decent water filter like a Big Berkey and know how to use it. If you do not have a filter you have the option of treating the water by boiling, Sodis or adding chlorine. Boiling is self-explanatory. Common household Clorox Ultra, Chlorox, Purex or chlorine bleach may be used to disinfect water in the following amounts. Four drops per quart gives 10 ppm in clear water. This amount should be increased to eight drops in turbid (cloudy) water. Sixteen drops will provide 10 ppm per gallon of clear water. You should be able to get a slight odor of chlorine after the waters sits for the 15 minutes. If not, add more Clorox. What most organizations that recommend chlorine don’t tell you is that chlorinated bleach loses it strength with time. After one year on the shelf, it will have lost 50% of its strength, so double the dose on old chlorine. Sodis is a method of disinfecting water using only sunlight and using bottles made of PET a type of plastic. Pet plastic bottles can be identified by the recycling number 1, usually located in a triangle on the bottom. 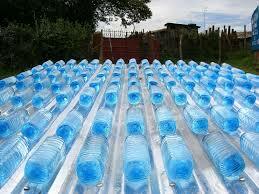 To use Sodis you fill Pet plastic bottles with contaminated water, and then lay them in the sun. The best place is a corrugated metal roof. Be sure to shake your bottles before placing in sun. The full bottles need to be exposed to sun for at least six hours. Sometimes this may require that you put them out a second day. Sodis will not work if the water is overly turbid, you should be able to read a medium print though the full bottle. All labels must be removed from the bottles and the bottle should be in good shape, not a lot of scratches. Remember the more you learn beforehand, the better off you will be. Is Swimming Pool Water Safe to Drink? This entry was posted in water purification, well and tagged water. Bookmark the permalink. One Response to Your Water has Failed What to Do Next? And,glass bottles will work, too. I save all my slender glass bottles. Also, glass bottles that maple syrup comes in since they are flat (not too far for the sun to travel).